I thought I had taught yoga to just about everyone already: elite marathon runners, chronic back pain sufferers, seniors in their 70's, 80s and even 90s. 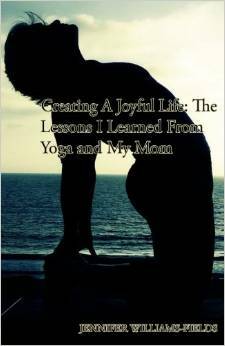 I've taught yoga to kids, teenagers, ballerinas, a wheelchair bound MS patient, and a woman who just received cochlear implants. I say it all the time: Everyone can do yoga - If you can breathe you can do yoga. But I never saw myself teaching yoga to a cow. Yes, a cow with black spots that says moo. This is the Chick-fil-A cow participating in the pre-race stretch before one of our local 5K races. Every year the organizers of the Mito-What 5K and the Munford 5K invite me to lead a stretch before the race. It's always fun and I meet so many potential new yogis. 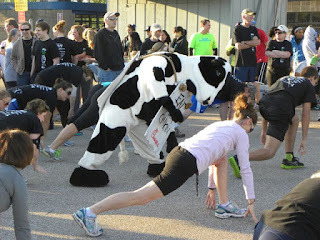 Well yesterday as I was leading the Mito-What runners through a flowing warm up I looked up, there was a cow right in front doing yoga. I started to laugh, which caused the front row of runners/yogis to turn around, and they started to laugh too. It was a great morning of yoga, running and laughter. And, I will no longer accept any reason anyone gives me when they say they can't do yoga!